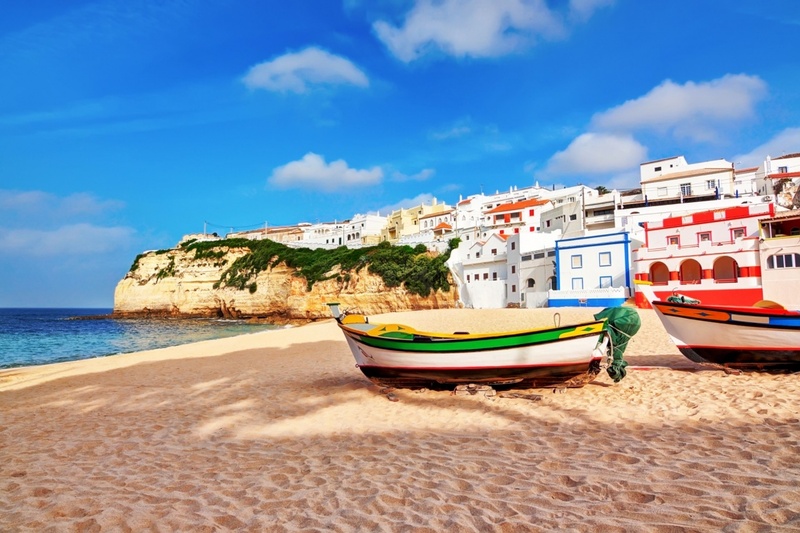 Carvoeiro is a traditional and picturesque fishing village (and now a popular tourist resort! ), situated practically on the border of Central and Western Algarve. If a quiet, relaxing Algarvian break is what you are looking for, Carvoeiro is the perfect place for you. There are actually only two roads that lead down to the main square, which leads off on to the petite beach. Being one of the smaller resorts in the region, this area usually attracts tourists who aren’t looking for the hustle and bustle and lively atmosphere that other resorts in the Algarve have. The small town is actually known for its large number of luxury self-catering accommodation that is available. It is not full of high-rise apartments block after block, unlike most resorts – in fact there aren’t really any high-rise apartments at all in Carvoeiro. The main square behind the beach is scattered with a few bars and good-quality restaurants, as well as many cutesy, boutique-style tourist shops. Be sure to try the food at Ele & Ela, which was awarded the TripAdvisor Certificate of Excellence 2013. It has been said that you can’t go to Carvoeiro and not visit this restaurant! Another great restaurant in the area is Onze, a sleek, sophisticated Mediterranean eatery with the best prawn kebabs and their own personalized ‘Onze Salads’. Even though Carvoeiro is small, there are over 75 restaurants to choose from, all providing a variety of cuisines. If you’d like to sample some of Carvoeiro’s nightlife, the main square provides visitors with a mixture of both homely, family bars and sophisticated hotspots for groups of friends. Although Carvoeiro is usually not one of the chosen Algarvian resorts for its nightlife, it still has a lot to offer and you certainly won’t be let down! Find information about selected Hotels, apartments and rooms in Carvoeiro to choose the perfect place for your accommodation.